When a game has the words “Anniversary”, “Definitive Edition” or “Remastered” you expect, well, something different from the original release. Maybe the game has received a big facelift. Perhaps the game has added levels or features, or maybe well known bugs have been removed, making for a better experience. Whatever the change, you don’t go into a newly released version of a game expecting nothing more than updated graphics. Unfortunately, that’s all you get with The Legend of Kay: Anniversary, another title to add to the fodder that is the anti-remake movement. The Legend of Kay was originally released back in 2005, part of a sort of second generation of character action-platformers following games like Jak & Daxter, Ratchet & Clank and Sly Cooper. 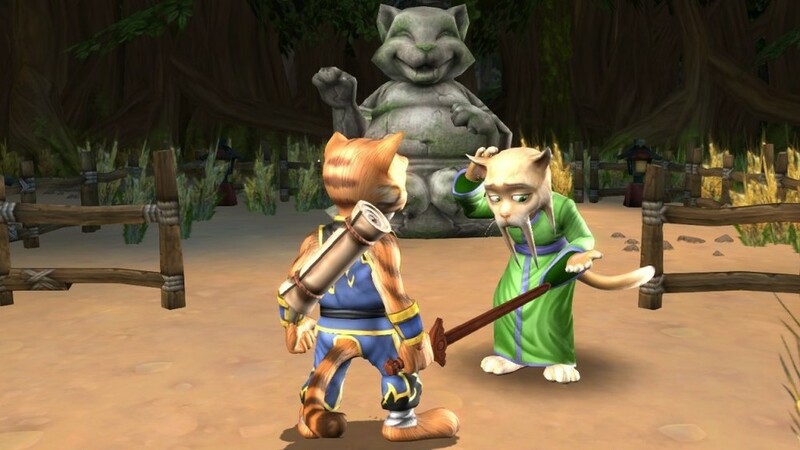 The Legend of Kay told the story of a cat, Kay, and his mission to bring back “The Way”, an ancient belief that was now lost due to the evil gorillas that dominated the kingdom. It wasn’t much of a beloved franchise in 2005, being overlooked for the aforementioned titles and their sequels. In fact, it seems like a weird choice to bring back now for a remastering as the game was above average at best. But we’re not here to talk about the 2005 version, no; we’re here to talk about its 2015 remake. Unfortunately for The Legend of Kay: Anniversary, the two versions don’t have much difference between them. This game looks, sounds, and feels like a title from 2005 and even then it’s not necessarily a promising title from 2005. While the game certainly received a graphical overhaul, the models and textures still look dated. The colors in-game have a nice pop to them but everything else just looks bland or uninteresting. Character models move with the same animations of the original game, which can feel extremely outdated to anyone who’s used to playing modern games. Combat is a big focus in The Legend of Kay: Anniversary as there is a storyline and world centered around martial arts. Completing missions and progressing forward unlocks new combat abilities and maneuvers that make the combat change as you go through the game. This is particularly true when you face new enemies who require certain moves to defeat them. However, those times are few and far between and even with the end boss I felt my main strategy, which worked earlier in the game for simple enemies, served me well. For a game that makes such a big deal about its combat, I felt rather bored during my playthrough. Updating graphics is a typical move for quick remakes but The Legend of Kay was in desperate need of an audio overhaul. Stuck somewhere between terrible children shows and equally bad educational games, The Legend of Kay’s lines of dialogue feel forced, ham fisted and dull. Dialogue is painful to listen to as most of it reads like someone interpreting samurai culture for the first time without any knowledge of the world whatsoever. Some of the dialogue feels oddly adult despite the child-like aesthetic, making the game feel even stranger than the forced samurai-like conversations do. I could go on ranting about the game but it wouldn’t do any good. The Legend of Kay: Anniversary is clearly a game that wasn’t shown much love in its remake. Instead, it looks and feels like a game that was put out back in 2005 with a somewhat prettier wrapping plastered over it. The forced dialogue, lacking visuals and boring gameplay do little to make The Legend of Kay: Anniversary worth the price of admission. After playing through Legend of Kay, I really have mixed feelings. I got used to its outdated features that were popping up from time to time, and really enjoyed the overall story and especially its delivery in a comic book fashion. The PS4 version just isn’t up to the challenge and doesn’t deserve to be played as the PC version is clearly better in every way. Grow Home is worth checking out if you’re looking for an interesting romp through a beautiful world with new mechanics in terms of platforming, just be ready to fall to your death and not understand why.